One of the things I notice about you is the enthusiasm you have for what you do. It's why I work here. I have a love of hurricanes, I always have. And this is the place to be if you love hurricanes. Where did that love of hurricanes come from? I grew up in southeast Louisiana, and there are a lot of hurricanes there. In the hurricane season of 1985, there was a lot of activity: Bob, Danny, Elena, Juan. There were storms all over the Gulf of Mexico, and I think that's what really got me interested. In late October of that year, I remember coming home from a Saints football game when Hurricane Juan was nearby. The waves were so high that there was spray on the Lake Pontchartrain Causeway Bridge! I was really hooked at a young age. My mom claims it is from when she took me out in Hurricane Bob when the center passed over New Orleans in 1979. I went to Northeast Louisiana University for the undergraduate degree and Colorado State University for the Masters. That tells me you came across Dr. Bill Gray. He was my Master's thesis professor and he was a great guy to work for. In person, he is exactly like he is to everyone. There are no shades to Bill Gray. He is exactly the same to the media and to his students. He is gregarious, friendly, talkative, just a great guy. Did he take you under his wing for his long-term climate prediction of storms? I was always interested in the long term forecasting. Before the age of the Internet, all you heard about it only came from the media. One of the big media events, even back in the '90s, was the seasonal hurricane forecast. Seeing it verify more right than wrong led me to wonder how in the world this thing works; this is interesting and fascinating. A lot of times you don't know where the storm's going to be five days in advance, especially in those days. But we had some idea what the season was going be, and I wanted to know more about that. Were you in on the ground floor of his work? I was not there at the beginning. Bill started his seasonal forecasts in the '80s. I was one of the last generations of his students. What I focused on was the August monthly forecast. Other people before me had done the full season. There was already an August update for the rest of the season. But there was a push to make the seasonal forecast more useful for shorter time periods. So I thought one interesting topic would be to figure out what August would look like. It's a ramp-up month for the tropical Atlantic, when you go from basically nothing to almost the peak of the season. Your August monthly outlook could be made or lost basically if systems form in the last week of August. It's different making an August forecast versus a September forecast. You carried that experience over with you to NOAA. How long have you been a part of its seasonal outlook team? I joined the team shortly after I arrived at the National Hurricane Center in 2002. That was right out of graduate school? 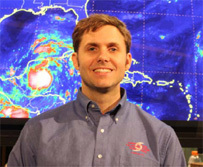 Yes, I was hired fulltime at the Tropical Analysis and Forecast Branch (TAFB) as a surface analyst for four years. And then, in 2006, I became one of the new additional hurricane specialists. Those additions were sorely needed, weren't they? Yeah, after the '04 and '05 seasons, there were way too many storms for just six specialists to handle. They desperately needed more help. I worked a lot of shifts those years. Other than your love of hurricanes, what is it about being a hurricane specialist that attracts you the most? To me, it's a very interesting job. During the hurricane season, the operational part of the job, you're constantly monitoring systems. It's doing what you love, and it's great that it helps prepare people. It helps warn the public, it helps save lives. It's a unique juxtaposition. It's a preparation time. What we did right last year, what we did wrong, how can we do it better. There is a lot of speaking to the public, and of course for me, the seasonal hurricane forecast preparation. It is not a hurricane preparedness tool, but a good awareness tool. So there is no rest outside of the hurricane season. People are not as aware of what we do in the off-season. It can actually be pretty darn busy, especially when you go to five or six conferences. You've got a week here, a few days there in the office, otherwise you are away. There's also the Hurricane Awareness Tour which is a long and rewarding experience. I have to ask you, where does your nickname "Twister" come from? It seems strange for a hurricane guy! Twister was the name of my first Dachshund. I got here in 2002 and actually snuck her in the office on a few midnight shifts. A few people saw that, plus she was a puppy and cried if I left her alone. A few people remembered that and started to call me Twister. You do have a fondness for animals, especially rescue animals. Yes, my last Dachshund is a rescue Dachshund. I love animals. My wife brought two cats into the household. She also found a litter of four one-week-old kittens outside in a box. We nursed them back to health, kept one, and found good homes for the other three. So we have kind of a zoo at home and, with the first child on the way, it's going to be an even bigger zoo. I was going to ask what you do in real life, but it sounds like your plate is full. Yeah, it's a lot. Before I broke my foot, I was a runner. I ran the Miami Marathon; I ran one in Ottawa, Canada. I was planning on running the New York City Marathon but that is not going to happen. I am looking for one to run before that, probably the Disney Marathon in January. Wow, 10 years. I imagine I would still be here, perhaps as a senior hurricane forecaster. If the shift work gets to be too much, then perhaps a branch chief or administration. Life changes a lot in 10 years.